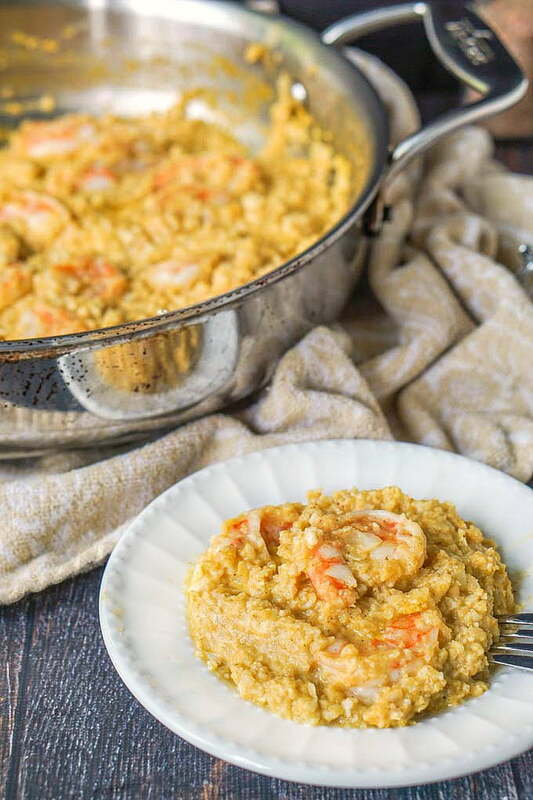 This low carb pumpkin risotto with shrimp and cauliflower is a breeze to make in less than 20 minutes! 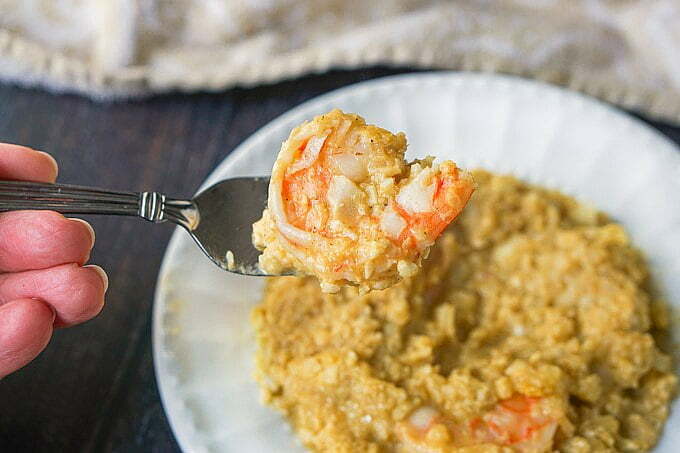 As a low carb dinner or lunch it is rich, creamy and full of flavor. One serving is only 4.8g net carbs! You might also like this low carb mushroom and brie cauliflower risotto recipe. 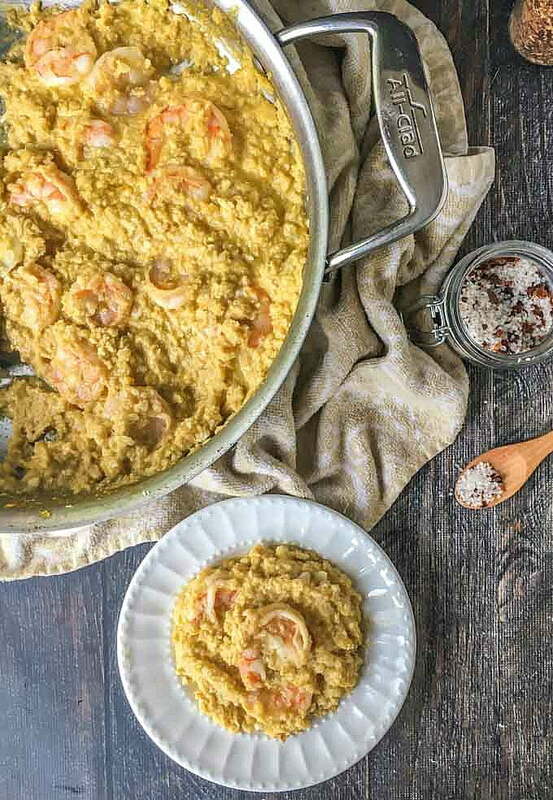 Let me first say that this risotto is not made with rice, but rather cauliflower rice. So if you are looking for authentic risotto this is not it. It’s my low carb interpretation of risotto. Now let me know also tell you this is a rich and extremely tasty low carb dinner and you can make it in under 20 minutes. 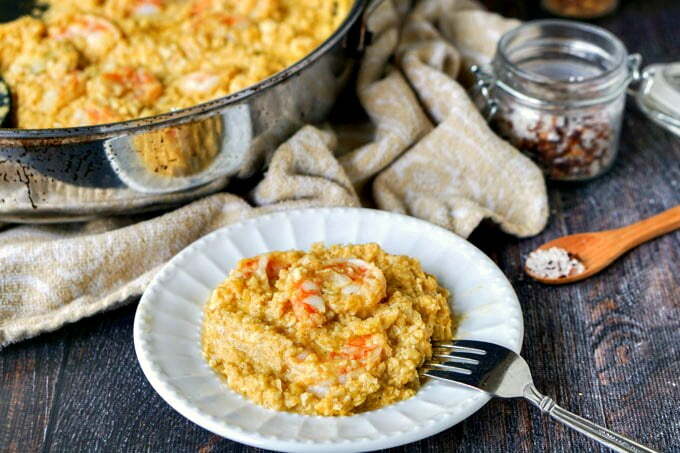 This low carb pumpkin risotto is made with sweet pumpkin, cream and Parmesan cheese. Believe you won’t miss the rice. When fall comes around I seem to only think of pumpkin. While I have quite a few sweet recipes I also have a few other savory pumpkin recipes. One of my most popular is my creamy pumpkin, sausage & kale soup. Pumpkin can add a bit of sweetness and also act as a thickener to soups. It’s nutrient dense but low in calories. Some people even consider it a superfood. 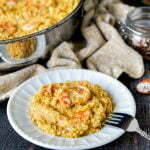 Cauliflower rice is very easy to find in grocery stores these days but I prefer making my own. I just take a few florets and pulse them in my mini food processor. Once it looks like grains of rice I take it out and do another batch.. This takes only a few minutes. I like to make extra and use it for other low carb recipes. First you want to melt some butter in a large saute pan. Add the garlic and cook for a minute until fragrant. Then add in the pumpkin, broth and cream. Whisk well to combine then add in the cauliflower and Parmesan cheese. Cook for about 5 minutes and then add in the shrimp. Saute for about 5-7 more minutes until the shrimp turn pink and are cooked through. That’s it folks! In a large saute pan, melt the butter and the add the garlic. Saute for a minute or two until fragrant. 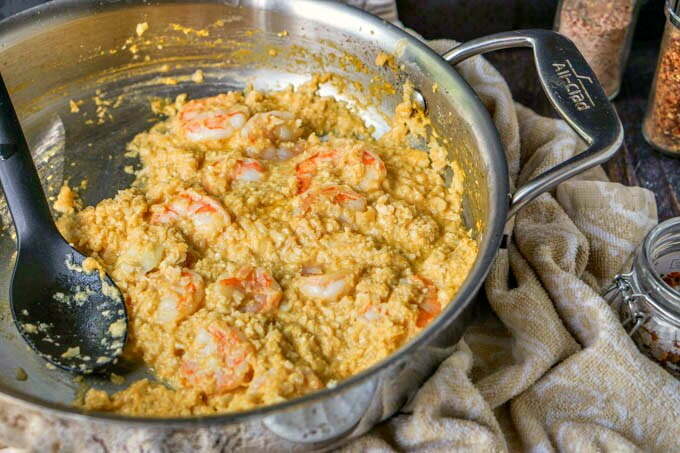 Pour in the cauliflower rice and Parmesan cheese and cook for about 5 minutes. Add in the shrimp and cook until pink. * Use pure pumpkin in a can. Not pumpkin pie mix.